If you’re considering hydrogen peroxide for acne, you’re in the right place. 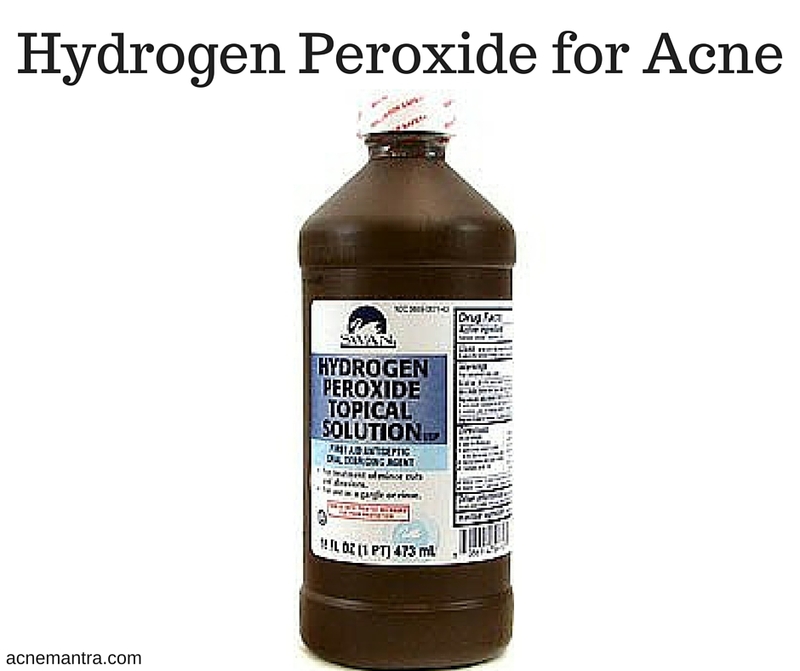 Read on to learn if hydrogen peroxide is good for acne or not. If you’ve ever asked the question “does hydrogen peroxide get rid of acne?” you’re not alone. Many people all over the world want to hear about hydrogen peroxide for acne, as it’s claimed to be a sort of miracle cure by many who are using it. While there are no such things as miracle cures, especially for acne, hydrogen peroxide does work for some people. As with all methods of acne treatment, it is not a one size fits all solution, so you must try it out with caution at first to see if you will find success or not. The best way to see the effectiveness of using hydrogen peroxide on your acne is to look at others who have been using it and see if it worked for them and why, or why not. Many people have raved about the pimples that have dried up and disappeared because of the peroxide treatment. It seems to be especially effective with large, tender, individual pimples that won’t respond to anything else. Hydrogen peroxide can help to clear up your oily skin and get rid of any pimples that are caused by this. Those with oily skin can find a lot of benefit from using hydrogen peroxide for acne. Most of those who use this acne treatment method applied the peroxide to their acne before going to bed. In the morning they mentioned a visible reduction in the amount of acne and the redness of the bumps. Using peroxide isn’t just a one-time solution. Some people have used it for years with the same effects as when they just started. If it works well for you, it’s possible to replace your regular acne treatment cream or lotion with hydrogen peroxide. Although most people treat white heads and bumpy acne with the peroxide, others have found it very effective at clearing up blackheads around the nose, cheeks, and chin. As much as hydrogen peroxide is promising for acne, it is not without side effects. Because hydrogen peroxide is good for drying out oily skin, it can be a very bad choice for those with drier skin or regularly oily skin. Some people who use it have reported a lot of irritation on their skin after they applied the peroxide. Skin irritation means something is wrong and you should stop using the product immediately. It can also lead to further breakouts or intensified acne breakouts. Those whose skin did not respond well to the drying out also mentioned that they got sores on their face from using hydrogen peroxide to treat acne. These sores are mostly harmless, but can be painful and tender. As the peroxide works to disinfect the pimples, sometimes it can leave the skin redder than it was before until the acne has cleared up or even for a few days afterwards. Some people who tested out the peroxide on their acne found that it just made it worse. This could be because of the irritation of the skin, the drying out, or some other reason as there are so many potential reasons for acne to appear. Whatever the case, since the acne did not clear up at all and actually got worse, this is a certain failure as a treatment method for some. In some extreme cases, hydrogen peroxide has been known to cause greater scarring on theface, even if the acne does get cleared up. This doesn’t happen for everybody, but some people have seen this as an unfortunate result of using this treatment. The most effective way to use hydrogen peroxide as an acne treatment is to put it on a Q-tip or cotton ball and dab it onto the affected areas of your face or else the areas which usually experience the most acne. This could mean the “T-zone” for some people, the cheeks for others, or the chin and neck. You can also use it off of the face if you get acne on your back, arms, legs, or chest. If you are concerned about drying out your skin too much with peroxide, try mixing it in with a moisturizer before applying it or else use a non-oil based moisturizer right after you apply the peroxide. Most people wash their faces before using hydrogen peroxide and do not rinse it off afterwards. Learn more about how to apply hydrogen peroxide for acne here. Is Hydrogen Peroxide Safe for Skin? While most people seem to be mainly concerned with the question “is hydrogen peroxide good for acne?” it’s also important to mention whether or not it’s a safe treatment method. You should leave the final call up to your dermatologist or doctor, but the research done on this offers a mixed result. Hydrogen peroxide is very effective topical disinfectant. This is what makes it so good for treating acne, as it going into the pores and kills the bacteria that are directly responsible for the acne infections, causing them to clear up quickly. The problem is that the peroxide does not discriminate between what bacteria to kill and what to leave. Your skin produces a lot of healthy, useful bacteria that keep away other infections and can make your skin better overall. It’s possible that using peroxide will lower the levels of healthy bacteria and put your skin at risk of other infections, although this is not a very common occurrence. As a response to the question of “will hydrogen peroxide help acne”, the answer just depends on the type of skin you have. Judging by the reviews, it seems that many people have found success using this method of acne treatment. Others have experienced bad results like skin irritation or increased acne, although it doesn’t happen to everyone. Overall, using hydrogen peroxide for acne can be a good solution, but you should proceed with caution to be sure you do not harm you skin.